Japan's determined bid to return to commercial whale hunting was rejected by the International Whaling Commission (IWC) Friday in a tense vote that exposed a deep split in the 72-year old organization. Japan's vice-minister for fisheries Masaaki Taniai said he regretted the vote's outcome, and threatened Tokyo's withdrawal from the 89-member body if progress could not be made towards a return to commercial whaling. 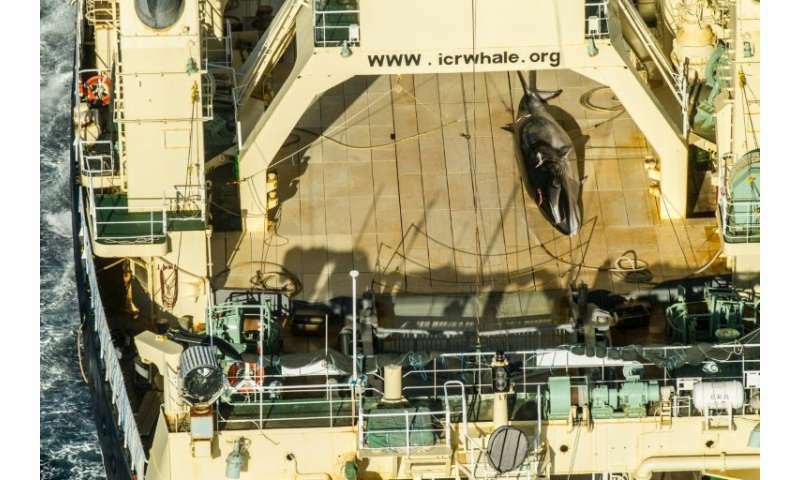 "If scientific evidence and diversity is not respected, if commercial whaling is completely denied ... Japan will be pressed to undertake a fundamental reassessment of its position as a member of the IWC," he said. Pacific and Caribbean island nations as well as Nicaragua and several African countries, including Morocco, Kenya and Tanzania, voted with Japan, as did Asian nations Laos and Cambodia. Korea abstained. The Russian Federation, which like several states allows aboriginal subsistence whaling, said it abstained because "this vote showed a sharp split within the Commission. Our worry is not to split the Commission too far and that's why we abstained." The IWC was set up in 1946 to conserve and manage the world's whale and cetacean population. It introduced a moratorium on commercial whaling in 1986 after some species had been fished to near extinction. 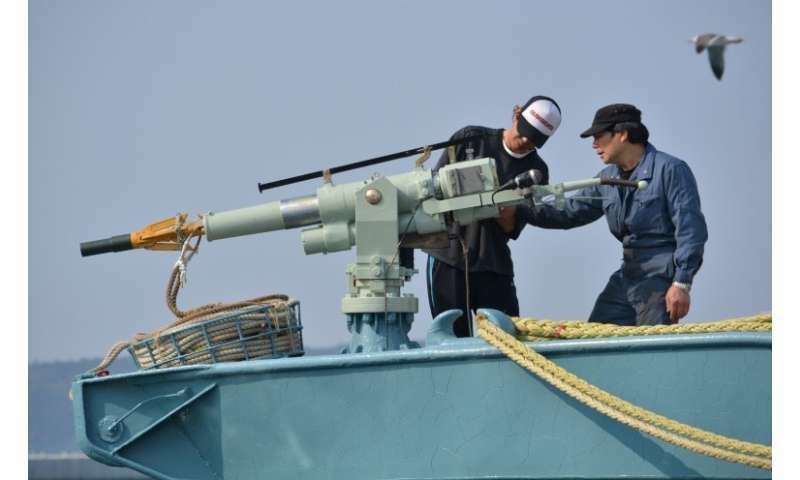 Japan insists whale stocks have sufficiently recovered to allow commercial hunting to resume. A protected minke whale seen onboard the Nisshin Maru at sea in Antarctic waters in January 2017; Tokyo currently observes the moratorium on whaling but exploits a loophole to kill hundreds of whales every year for "scientific purposes"
Norway and Iceland ignore the moratorium and are key supporters of Japan's bid to resume commercial whaling. A Japanese withdrawal would have far-reaching consequences for the organization, given support from a growing number of developing states in the IWC. They say the IWC's mandate is both to conserve and manage—meaning to sustainably hunt—recovering whale stocks, but that the emphasis within the organization has leant too far towards conservation, leaving pro-whaling nations without a voice. Taniai said the vote result "can be seen as equivalent to the denial of the possibility for governments with different views to coexist with mutual understanding and respect within the IWC." Australia's commissioner Nick Gales rejected "the narrative of underlying dysfunction and intolerance" suggested by Japan. He urged Tokyo to remain in the organization "to continue to argue for its view and work constructively with all members." Japan's "Way Forward" including the establishment of a "Sustainable Whaling Committee" within the IWC, and a "Diplomatic Conference of Contracting Governments" to amend the body's voting rules, changing them from requiring a two-thirds majority to a simple majority. 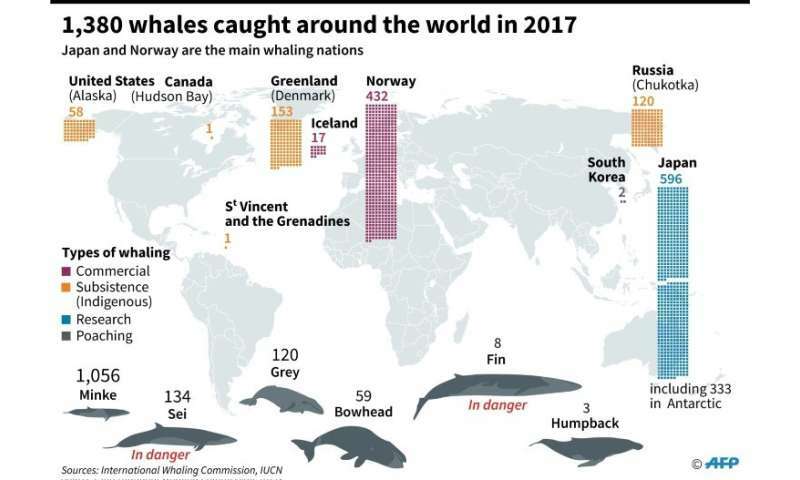 Map locating the main whaling nations and different species of whales caught around the world in 2017. Anti-whaling NGOs cheered the result, but it seems clear from the week-long meeting in the surfing resort of Florianopolis that Japan's impatience with its fellow members in a sharply divided IWC is growing. Kitty Block, head of the animal charity Humane Society International, said "the IWC's moral compass" had led it to reject Japan's proposal. "It's clear from exchanges this week that those countries here fighting for the protection of whales are not prepared to have the IWC's progressive conservation agenda held hostage to Japan's unreasonable whaling demands." To add insult to injury from Japan's point of view, the IWC adopted Brazil's "Florianopolis Declaration" which envisages whale protection in perpetuity. And Glenn Inwood, of Opes Oceani, a company that analyses developments in the use of ocean resources, says there is no longer much of an economic or political case for Japan remaining in the body. "Japan invests tens of millions of dollars each year into its whaling activities but gains very little from the IWC despite being its biggest benefactor," said Inwood, a former spokesman for the Japanese delegation. Support in the wake of Friday's vote "is increasingly difficult to justify," he said. "We learned from the United States' decision on the Paris Accord that countries are willing to revisit support for international agreements that aren't in sync with their national interests."